These all information are not granted by us. For all these services you can call to Mr. Surapong at 089-494-1946. He can provide all type of Carpets, Chicks, Films, Curtains, wall papers, at reasonable prices. At present the Internet and Land line connection is only provided by TOT and it’s come with package of internet. We use internet or not, we need to pay for modam and all. It cost all together about 3,000 baht at once and then monthly charges as per the speed we choose. For more updated information please call to the management office of each phase. There are many service providers now. We have listed below, some of then so you can talk to any of them. There are more condos (brand new) available for rent. Starting from Studio, One bedroom and Two bedroom, with the facility of cloth washing and maid service. We do provide the Dry cleaning service. It’s all depend on customer requirements. You can see photos and videos at gallery or on home page’s posts. All studios, one bedroom and two bedroom looks same and the furniture and space is also almost same. So by looking all these pictures you can have an instant idea. The new skytrain link from downtown Bangkok across the Chao Phraya river to Thonburi began operating on Friday, May 15th, 2009, giving commuters a welcome option to the slow trip over the often congested bridges. The new 2.2 kilometer track, part of the Bangkok Mass Transit System (BTS), extends the service from Saphan Taksin station to Wong Wian Yai. 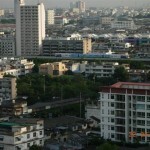 It was funded by the Bangkok Metropolitan Administration. Travel on the new section will be free for the first three months. Till 12th August, 2009.
extended Silom line from May 15 to August 12 during the real trial run. to preside over the opening of official trial run on May 15.